Fly selection can be an extremely important element of saltwater fly fishing in Puget Sound, but how does a new saltwater angler go about choosing a fly? This is a subject I feel strongly about and hopefully I can help shed some light on this topic. First and foremost, I am a huge believer in confidence. Having confidence in your gear, and that the fly you are using will produce fish is a huge part of successful saltwater fly fishing. The problem is that in order to have confidence in your fly, you have to have had enough success to actually build that confidence. When you’re just starting out this can be a difficult cycle…. You need to find success in order to gain confidence in what you are using, but if you aren’t catching fish for a multitude of reasons then that success is not going to come. I completely get this problem and I can absolutely relate. When I was first starting out fishing the salt I used to constantly wonder if I was using the right fly, and would change flies frequently looking for that magic pattern. Over time I eventually began to catch enough fish that I started to develop some confidence in certain flies for certain situations, but this was a slow process. The best piece of advice I can give any new saltwater angler is to start with a very basic selection of flies that are known to produce, and spend as much time as possible fishing and as little time as possible worrying about the fly. When targeting sea run cutthroat, a box with some chartreuse/white as well as olive/white Clouser Minnows, Delia Squids, Squimps, Spiders, Sculpin, and some generic baitfish patterns will get you by 90% of the time. In the time I’ve been fishing cutthroat in the salt I can count on one hand the amount of times that I absolutely needed a specific fly pattern to catch fish. In general sea run cutthroat, like most saltwater fish, are aggressive. They simply don’t pass up a meal very often. Its my belief that the biggest aspect of successful saltwater fly fishing in Puget Sound is finding the fish. Once found, they can generally be caught on the basic patterns I listed above. The great thing about fishing in the salt is just because the fish are feeding heavily on juvenile herring, for example, does not mean they will turn their nose up at a chartreuse/white Clouser minnow. I spend an awful lot of time fly fishing Puget Sound, and its not very often that I encounter a scenario where the fish are so selective that the exact right fly is needed. By starting off with a small box of basic flies, the overwhelming decision of trying to pick a fly can be semi removed from the equation. Basically if you only have a few flies at your disposal then you have no choice but to fish them hard. This is key. Learning how to find the fish should be the focus. Worrying about the fly should be the furthest thing from your mind most of the time. I know it’s easy to say this, but I strongly believe it to be the truth. If I had to take a guess I would say that probably 90% of all the fish I catch in Puget Sound are caught using the same handful of patterns. Clouser Minnows, Delia’s Squids, Squimps, and a chartreuse/pink/white surf candy style fly easily account for the bulk of my fish. Whether I am fishing for salmon or sea run cutthroat, I find myself turning to these patterns more often than not. This has come as a result of countless hours spent on the water, as well as countless hours spent at the vise. I love to tie new flies as much as any fly angler, and I carry several boxes of flies during any saltwater outing, but it never fails that the bulk of my fish come on these flies. As a result I have strong confidence in these patterns. I know in my heart that if I find some fish, I can usually get them to eat one of these patterns. That’s not to say that situations don’t arise where I need to fish something specific, but in my experience these situations are fairly rare. I am also not a huge fly changer. I tend to stick with one of these patterns just about all the time, rarely changing things up if I’m not catching fish. Rather I believe that if I’m not catching fish the most likely scenario is that there just isn’t a concentration of fish where I happen to be fishing. I will often tie one of these patterns on in the morning, and fish it the entire day. The only exception to this is when there are obviously fish present, but they are not taking my fly. If I see fish jumping, crashing baitfish, rising on the surface, or just visually spot fish swimming but I am not getting any action then I will start changing flies. Generally speaking I will cycle through my “confidence” patterns first, unless there is an obvious food source present. For example, if there are large schools of chum fry present during a spring outing, and fish are ignoring my usual offerings, then I will change to a chum fry imitation. Or maybe I’m seeing fish crashing a ball of herring, but I’m not hooking fish with my usual flies… At this time I will switch to a herring patterns. Again though, these situations are rare. It seems when I find fish aggressively feeding on one particular food source, I can generally hook plenty of fish fishing these same patterns. Ultimately when it comes to fly selection I’m a big believer in not over thinking things. While it’s certainly good to have a variety of flies in various sizes, colors, and profiles, the situations that absolutely require perfectly imitating the naturals are rare enough that for someone just starting out I believe they are best served by keeping things simple. 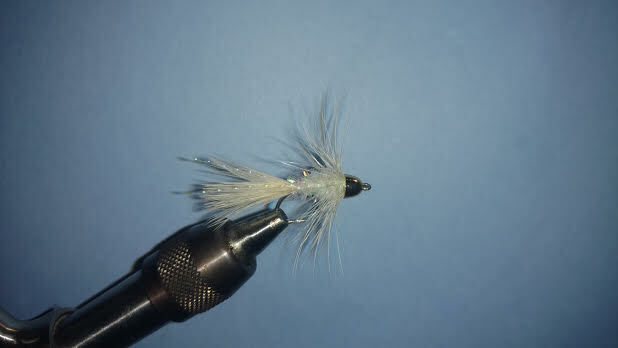 As you gain more experience in the salt you will learn to recognize the situations where a specific fly is required, and every time you encounter this situation without having the correct fly in your box you are sure to go buy/tie some new patterns in case you ever run into that situation again. Over time you will end up with a large collection of flies as you encounter more of these situations, and it won’t be long till you’ll have just about every possible food source covered by the flies in your boxes. I strongly believe that keeping things simple is important when starting out fly fishing the saltwaters of Puget Sound, but it’s certainly not the only way to succeed. For some, “matching the hatch” is a very enjoyable aspect of fly fishing and they prefer to fish flies that perfectly imitate the natural food sources available at any given time. There is absolutely nothing wrong with this, it’s just not my style. If I have the option of catching fish on a simple to tie Clouser Minnow when the fish are feeding heavily on sandlance, then I’m happy as clam. For others, they won’t get the full enjoyment unless they catch the same fish using a meticulously tied sandlance imitation that closely resembles the naturals. In the end only you can decide how you like to fish. By keeping your fly selection simple you will be forced to spend your energy learning how to find fish, read the water, read the tides & how to locate water that is most likely holding fish. By focusing your efforts in this area I strongly believe you will quickly become a better saltwater angler. By keeping your fly worries to a minimum your mind will be free to focus on the points mentioned above. If you’re constantly worried about whether or not you have the right fly tied on, or are constantly changing flies because fishing is currently slow then you may end up focusing less on how to actually find the fish, which in my opinion is counter productive. Next time you hit the beach, or take the boat out in the sound, and are worried about choosing the right fly, try to remember to keep things simple. A small box with a handful of known productive flies will be all you need to catch fish 90% of the time. The other 10% of the time will take care of itself over time. Keep your fly in the water, and learn to fish the right water…. Fish will soon come, and as they do your confidence will grow.